Considering all the intensive conditioning, practice and training they do, most people would expect elite athletes to be… well… healthy. And that’s generally true — except when it comes to their oral health. 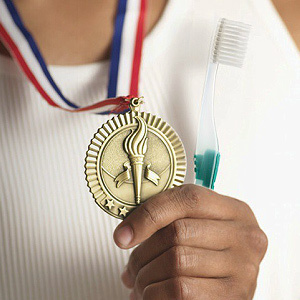 A major study of Olympic contenders in the 2012 London games showed that the oral health of athletes is far worse than that of the general population. That comment, from Dr. Paul Piccininni, a practicing dentist and member of the International Olympic Committee’s medical commission, sums up the study’s findings. In terms of the numbers, the report estimates that about one in five athletes fared worse in competition because of poor oral health, and almost half had not seen a dentist in the past year. It also found that 55 percent had cavities, 45 percent suffered from dental erosion (excessive tooth wear), and about 15 percent had moderate to severe periodontal (gum) disease. Many of the factors that had a negative impact on the athletes are the same ones that can degrade your own oral health. A follow-up paper recently published in the British Journal of Sports Medicine identified several of these issues. One is a poor diet: The consumption of excessive carbohydrates and acidic foods and beverages (including sports drinks) can cause tooth decay and erosion of the protective enamel. Another is dehydration: Not drinking enough water can reduce the flow of healthy saliva, which can add to the damage caused by carbohydrates and acids. The effects of eating disorders (which are more commonly seen in certain sports, such as gymnastics) can also dramatically worsen an individual’s oral health. Sound familiar? Maybe it’s because this brings up some issues that dentists have been talking about all along. While we don’t mean to nag, this study does point out that even world-class competitors have room for improvement with their oral hygiene. How about you? Whether you’re a triathlete in training, a weekend warrior or an armchair aficionado, good oral health can have a major effect on your well-being.